Buckhead glam is staging a comeback. For proof, look no further than Mission + Market—if you can find it. The confusing location in the Never Never Land behind Phipps Plaza does not adequately broadcast what’s in store, but once you’ve stumbled into the Alliance Center space, the allure of the scene is unmistakable. Where else but in a neighborhood synonymous with the confluence of commerce and party life would you find a crush of singles ready to spend whatever it takes to satisfy their various appetites? The real surprise, however, is that Mission + Market is as serious about food as it is about style. Born in a tiny village a few miles from the southern coast of England, Ian Winslade describes himself as a reluctant chef. His dream was to become an engineer, but, lacking the resources, he went to culinary school instead. Classically trained in French cuisine, he scored an apprenticeship in London and bounced around some of the United States’s most prestigious restaurants (Le Bernardin and Jean-Georges among them) on both coasts, ending up in Atlanta. In 1994, he was the opening chef at Tom Catherall’s then revolutionary Tom Tom in Lenox Square. At 54, after working for decades at places such as Bluepointe and Murphy’s, he has finally taken the plunge and opened a place of his own. No longer will anyone tell him what to put on his menu. Ian Winslade, a classically trained chef, grew up near the southern coast of England. Winslade, who describes himself as “practically a pescatarian,” isn’t the kind of chef who wants to break down a whole pig or limit himself to the fare of the South. 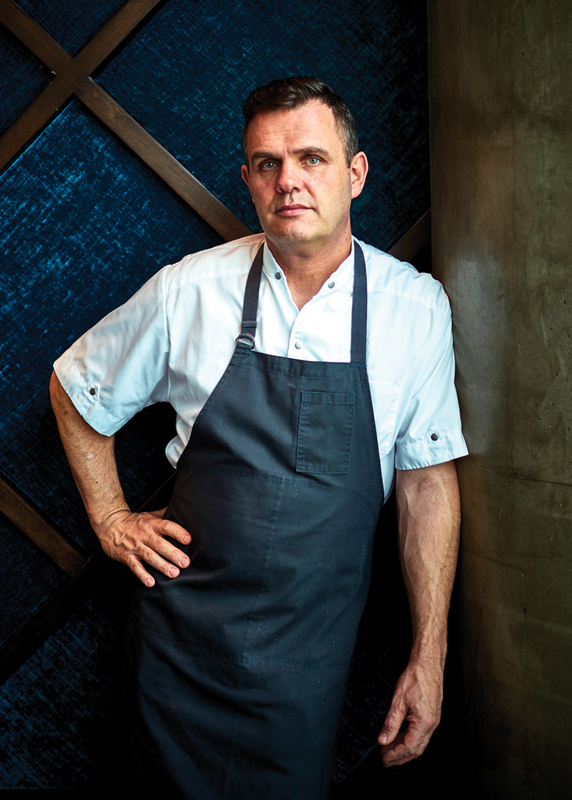 He is mostly inspired by the West Coast, where food tends to be lighter and more global. His backers in Mission + Market, Jonathan and Tony Akly, whose various business ventures focus on restaurant design and construction, are lucky to have found in Winslade a chef ready to explore his newfound freedom. Winslade spent his childhood minutes away from the ocean, with beautiful fresh fish in abundance, and it’s no coincidence that the vast majority of his dishes at Mission + Market involve delicate seafood preparations, many of them using no heat at all. It takes skill and knowledge to handle raw fish this way: glossy American red snapper with yuzu emulsion and impossibly thin Fresno chilies, juniper-cured steelhead trout with micro radish, albacore chu-toro painted with sesame. 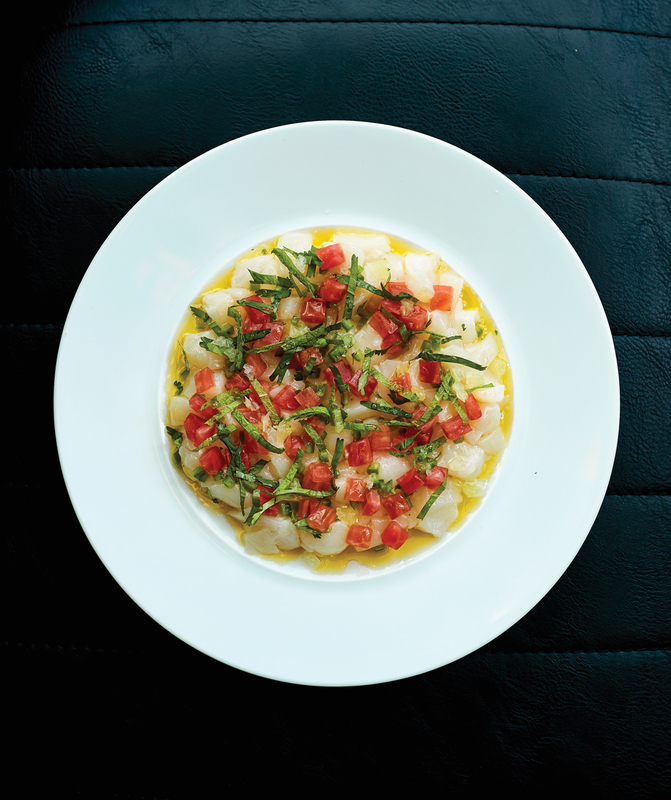 The best of these is a pearly ceviche of dayboat scallops with cilantro, mint, tomato, and jalapeño, simply seasoned with olive oil, lime, and fleur de sel. The bracing astringency of Winslade’s pickled oysters (with Sichuan pepper, cucumber, and lemon) is at the opposite end of the spectrum from his mellow, butter-basted clams with celery salad. His talents are on fullest display in a masterful dish of Maine mussels opened in white wine, garlic, shallots, and European butter, arranged like a bouquet and finished with bright parsley and lacy rusks of grilled bread. 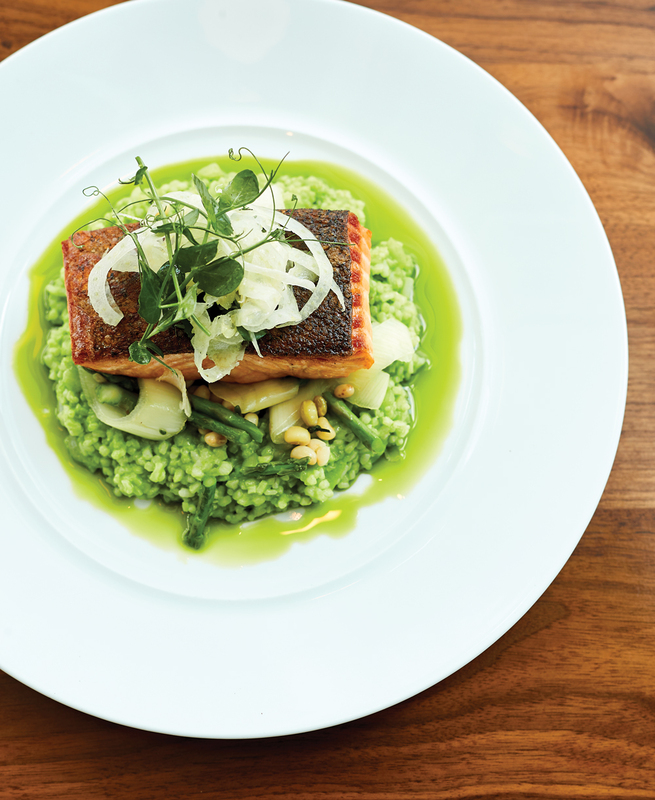 Among the entrees, the almost-creamy steelhead trout over pea-scented rice grits is a miracle of delicacy, while the slender fillets of pan-sauteed European black bass feel timid next to a vivid pool of beet raita scented with cumin. Not everyone has to eat fish at Mission + Market; there is a stupefyingly rich and delicious wild mushroom polenta with a centerpiece of marrow bone (properly cut crosswise); a hearty rigatoni alla bolognese in a mist of microplaned Parmigiano Reggiano; and, for customers with more mainstream taste, a few pizzas and hamburgers. Among the desserts, a matcha cake made with powdered green tea and pistachio creme patissiere and a strawberry rhubarb sundae with vanilla ice cream, sea salt, shortbread cookie, whipped cream, and toasted pecans are both easygoing and on the lighter side, if a little low on pizzazz. A bottle of wine from the well-composed list is a better option than the often-silly riffs on classic cocktails or a glass of pinot noir from the Willamette Valley served at too warm a temperature. How does someone humanize a giant glass box in an office park? Tony Akly of Restaurant Consulting Group, a structural engineer with an appetite for flashy details, pulls it off with a living wall of yellow-green moss, a trail of electric blue, crushed-velvet banquettes, mature ficus trees, a reasonably friendly show kitchen, and a sprawling patio. The combined effect counterbalances the severe slate and concrete aesthetics. 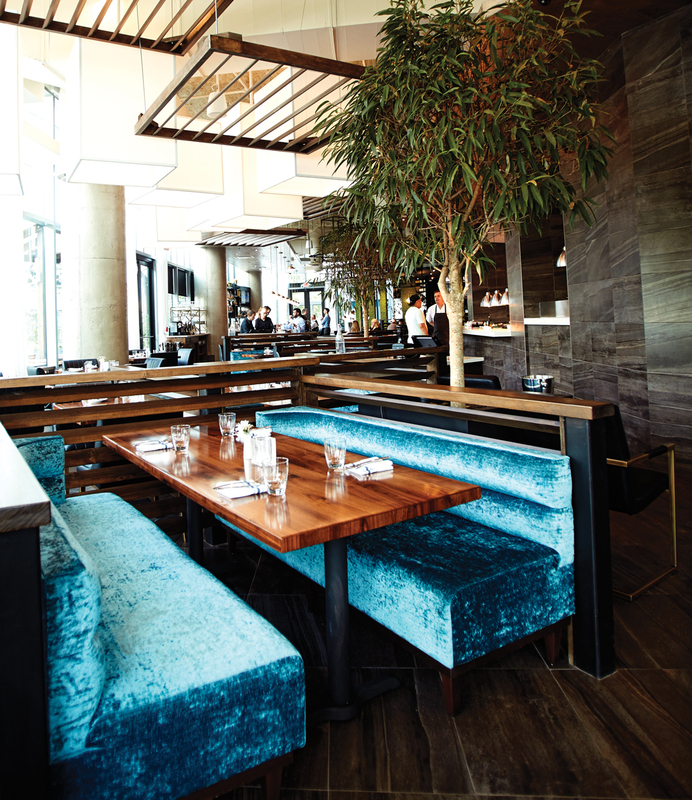 Mission + Market is rigorous enough about its food for gourmands and glamorous enough for scenesters. It also allows an old-school chef to return to what he truly loves: seafood without fuss.